My philosophy when it comes to happiness and life in general is to keep things simple — this means clearing out clutter and making room for the things you love and that serve a purpose in your life. Today, I want to bring this idea to your beauty routine. Waking up in the morning and having to dig through bottle after half-empty bottle of lotions and serums and perfumes in order to find the one you’re looking for creates stress and clutters your mind. By simplifying our beauty routine, we can cultivate a pleasant experience when it comes to our morning and nightly routine, and we can clear our mind, body, and skin of anything that is no longer serving us. This is my top tip when it comes to editing your beauty routine because I am very passionate that what you put onto your skin, your body absorbs and can wind up in your bloodstream, which means that we need to keep synthetic chemicals, fragrances, and additives off of our skin. Make sure that the ingredients you slather onto your skin in the form of skincare products, make-up, body lotion, body wash, deodorant, etc. are composed of plant-derived ingredients that you recognize, not scary-sounding chemicals and synthetic additives. Simplify your beauty routine by cutting out any products that have harsh chemicals and synthetic ingredients. To me, this keeps shopping for beauty products simple, because if a product contains ingredients I don’t know or that sound synthetic, I just don’t buy the product. I wait or search until I find a product that is 100% natural and preferably organic as well. Clear out the medicine cabinet. It feels so good to clean out your cluttered bathroom and give yourself permission to get rid of anything you’re no longer using — the half empty bottle of shampoo you didn’t really like, the moisturizer you got as a gift that made you break out, the millions of free samples that you’re never going to open. Just toss them and clear your mind and space of all that clutter. Then, you have room to display the products you do use so that they are easier to get to and even look pretty displayed on your counter or shelf. Refine your selection to certain stores or brands that you trust. Like I mentioned above, I simplify my shopping by simply not purchasing products that are synthetic. To simplify even more, find brands or stores that you trust to have only natural products so that you don’t have to search so hard for what you want. A quick glance at the label of a favorite organic brand should confirm that the ingredients are in fact natural and/or organic. You can also shop in places like Whole Foods, your local Co Op, or online specialty stores such as LeVert Beauty, CAP beauty, Spirit Beauty Lounge, etc – these stores only sell brands that they believe to be clean and natural, so you don’t have to scour the aisles at your local drugstore to find a healthy product. Simplify the steps in your routine. The typical skincare routine includes at least 3 steps: cleanse, tone, and moisturize. Many beauty magazines or cosmetics companies make you feel as if, on top of that, you also need a day cream, night cream, serum, eye cream, exfoliant, hydrating mask, and clarifying mask, among various other products. To me, this is way too overwhelming. I have found that for my skin, the simpler the better. The fewer products and the fewer ingredients, the better my skin responds. Whenever I add too many new products into my routine, my skin kind of freaks out, causing dryness or breakouts. I definitely use a cleanser and moisturizer day and night, but other than that, I don’t use much. I like to have an exfoliant of some sort to throw into my routine every couple of days, as well as a good mask on occasion. But when it comes to shopping for skincare, I recommend focusing on the things you are going to use daily, and not getting distracted with all of the other products that stores will make you feel like you need. Use what works for your particular skin and don’t be deterred by the sales lady that ensures you need a 6-step skincare regimen. Find a gentle cleanser that will rid your skin of dirt or makeup that has accumulated through the day, but won’t strip your skin of precious natural oils. These oils keep your skin supple and healthy, and by stripping them all away with a cleanser that is too harsh, your skin will overcompensate and produce excess oils, causing clogged pores and blemishes. You should also find a natural moisturizer that is full of mostly plant ingredients and keeps your skin feeling hydrated and healthy. In my opinion, there is no need for a specific day and/or night cream, just find one that works with your skin and use that whenever needed. As I mentioned above, I also like to have a natural enzyme exfoliant and a clarifying mask for my particular skin, but these are not used every day. These are just what I consider to be essentials when it comes to my own skin, but if there is something specific to your skin that you feel you need, be sure to keep that in your routine and find a healthy, natural version of it. I keep my shower products very simple as well. All you really need is a good shampoo, conditioner, and body wash that don’t contain harsh ingredients, parabens, sulfates, etc. 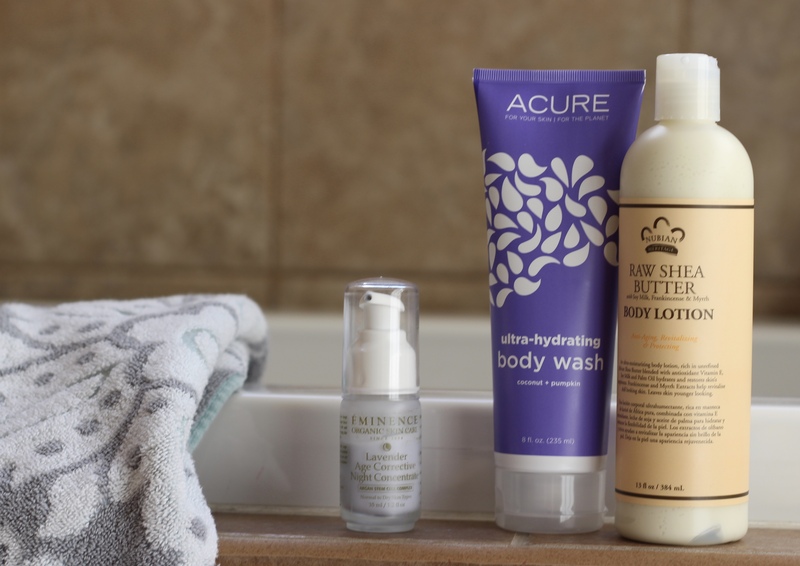 I use Acure Organics shampoo, conditioner, and body wash, which each cost under $10 and can be found at most Co Ops, Whole Foods, or can be bought online. 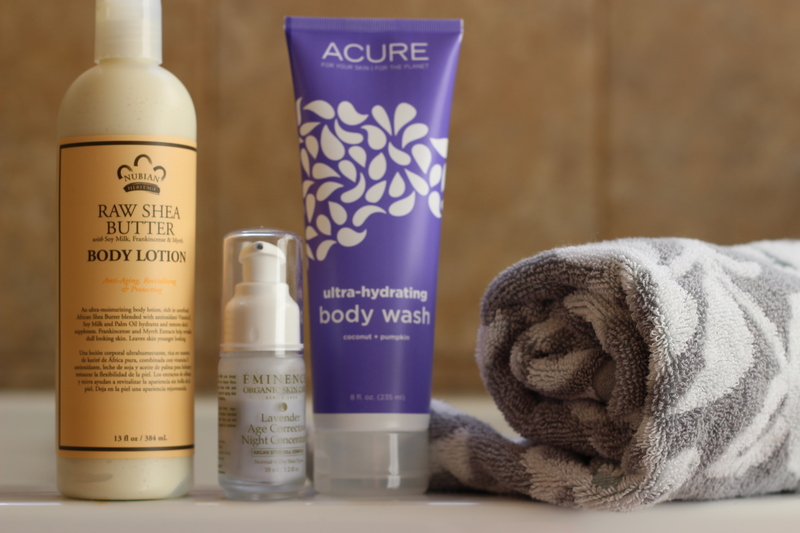 Hydrate your skin after your shower with a quality natural body lotion and you’re good to go! In my opinion, skin care should be simple and should come from the earth. It just makes sense that products you put on your skin should be real, natural ingredients because your skin absorbs what is put on it. We shouldn’t eat synthetic chemicals and we shouldn’t put them on our skin, either. This is just asking for health problems down the road. I also believe in having as simple a routine as possible, because our skin can heal itself naturally; it doesn’t need hundreds of lotions and potions to keep it healthy. In fact, I would argue that this confuses the skin’s natural ability to keep itself balanced, and causes it to be overly dry or oily. I do believe, however, the skin can benefit from gentle, natural products that work synergistically with the skin’s natural process. Therefore, my philosophy is to keep your beauty routine as simple as possible with real, natural ingredients.